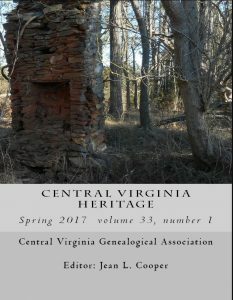 Spring 2017 Central Virginia Heritage Available! Hi all — I was aiming at March 1st as the publication date for the Spring issue, but I managed to make it a Valentine’s Day baby instead! For those who are not members, we offer the opportunity to purchase a printed copy of each issue. The Spring 2017 issue is available from Createspace.com/6566260 for $6.50. Click on the CreateSpace.com link above or search for “Central Virginia Heritage” on the Createspace.com Store site. This entry was posted in Newsletter, Research by cvgaboard. Bookmark the permalink.